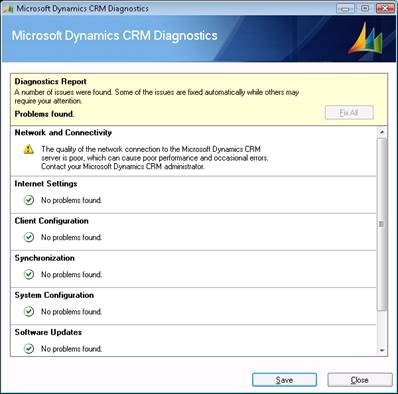 The Microsoft Dynamics CRM 4.0 Client Diagnostics feature is new for the MSCRM 4.0 Outlook Client only. MSCRM Client Diagnostics is intended to aid in diagnosing common issues with Deployment, UI, Synchronization and Offline features. MSCRM Client Diagnostics provides two different modes of operation, End User Mode and Support Mode. The intent of this blog is to introduce the user, at a high level, to the diagnostics features. Does Microsoft Dynamics CRM for Outlook have connectivity? 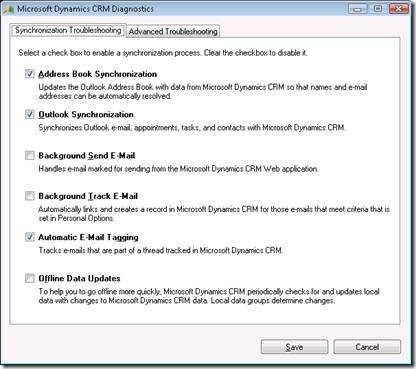 Is Microsoft Dynamics CRM for Outlook offline? Are the Microsoft Dynamics CRM authentication credentials valid? Is the user a member of an existing organization? Is the user still a member of the organization? Is the user enabled and does the user have at least one security role? Does the user have permission to synchronize to Outlook? Does the user have permission to synchronize the address book? Does the user have permission to create activities? Does the user have permission to go offline? What is the network quality, including speed and dropped packets? Is Microsoft Internet Explorer set to prompt for authentication? This issue can be fixed with the tool. Does the pop-up blocker include the Microsoft Dynamics CRM URLs as safe sites? Are cookies being transmitted between Microsoft Dynamics CRM for Outlook and the Microsoft Dynamics CRM server? Are the registry keys correct? Was a non-Microsoft Dynamics CRM Outlook profile recently opened? Are there multiple Outlook profiles? Was the Microsoft Dynamics CRM add-in disabled? This issue can be fixed with the tool. Was the Microsoft Dynamics CRM add-in listed as an unsafe add-in? This issue can be fixed with the tool. Is the Microsoft Office Excel add-in registered correctly? 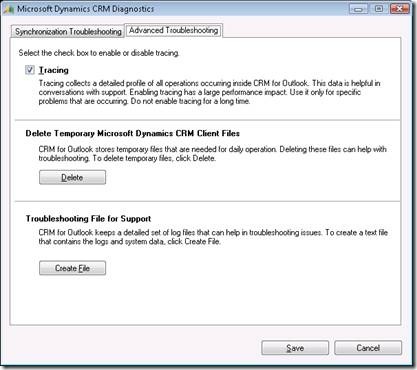 Are the Microsoft Dynamics CRM address book files corrupted? This issue can be fixed with the tool. Are there multiple Outlook processes running? Are COM objects registered correctly? Is the Microsoft Dynamics CRM Application Host process responding to HTTP requests? Can Microsoft Dynamics CRM for Outlook with Offline Access initialize? This issue can be fixed with the tool. Were there recent errors when synchronizing to Outlook? Can Microsoft SQL Server Express be contacted? Is the Outlook synchronization subscription valid? This issue can be fixed with the tool. Is the address book synchronization subscription valid? This issue can be fixed with the tool. Are the offline synchronization subscriptions valid? This issue can be fixed with the tool. Is the memory load acceptable? Is the installed memory sufficient, based on installation recommendations? Is the processor speed sufficient? Is there enough free disk space? Are Microsoft Dynamics CRM for Outlook Auto-Update updates available? Is the Microsoft Dynamics CRM for Outlook cache size acceptable? Are the application host process shut-down options acceptable? Is the metadata cache size acceptable? Is the offline database size acceptable? Is the address book size acceptable? Is the e-mail tagging performance acceptable? Is the Outlook synching performance acceptable? Is the offline synching performance acceptable? When diagnostics have completed, the user has the option to save the results to an XML file by clicking the ‘Save’ button. Support Mode may require Administrator privileges on the Client Computer to access files and registry settings. Support Mode is more about troubleshooting problems as directed by support. 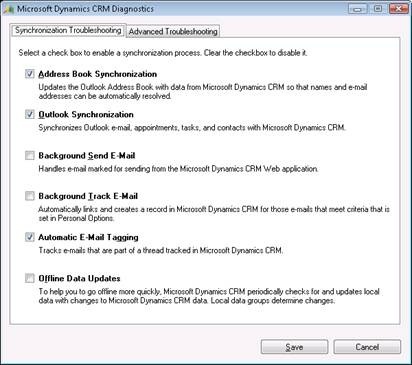 Address Book Synchronization- Updates the Outlook Address Book with data from Microsoft Dynamics CRM so that names and e-mail addresses can be automatically resolved. Outlook Synchronization- Synchronizes Outlook e-mail, appointments, tasks, and contacts with Microsoft Dynamics CRM. Background Send E-Mail- Handles e-mail marked for sending from the Microsoft Dynamics CRM Web application. Background Track E-Mail- Automatically links and creates a record in Microsoft Dynamics CRM for those e-mails that meet criteria that is set in Personal Options. Automatic E-Mail Tagging- Tracks e-mails that are part of a thread tracked in Microsoft Dynamics CRM. Offline Data Updates- To help you to go offline more quickly, Microsoft Dynamics CRM periodically checks for and updates local data with changes to Microsoft Dynamics CRM data. Local data groups determine changes. The ‘Advanced Troubleshooting’ tab contains the toggle for ‘Tracing’ and functions to ‘Delete Temporary MSCRM Client Files’ and create a ‘Troubleshooting File for Support’. ‘Tracing’ can be turned on or off by simply checking or un-checking the checkbox and clicking the ‘Save’ button. ‘Delete Temporary MSCRM Client Files’ is very thorough and will also delete setup and configuration log files, so back-up the files you want to keep before using this feature. 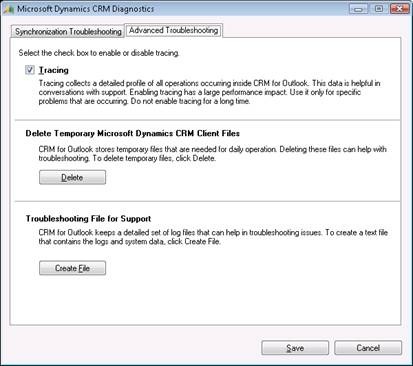 ‘Troubleshooting File for Support’ will create a zipped text file containing details of the files and registry settings for CRM, Office and Internet Explorer. Copies of the setup and configuration log files as well as trace and the ‘Outlook Errors’ file. An unfortunate feature cut due to security reasons, was the ability for partners to add their own tests to MSCRM Client Diagnostics. Based on User and Support feedback we may revisit this feature in future updates. There are many dependencies that the MSCRM Outlook Client requires for MSCRM to operate and diagnostics of the basic requirements should be very helpful, even to the end user. Look for future blogs on this subject.